Fabien from France and Trang from Hanoi led a very different life just a year ago. They were running a Vietnamese restaurant nearly 12,000 kilometers away from Saigon, in Morocco. “Morocco is a land of nature…[that was] one of the reasons that made us move there. Fabien was a businessperson in France and his experience really helped us succeed,” Trang told Saigoneer. She spent 15 years in Paris, where she studied to become an architect. She recalled spending two and a half years in Morocco's vibrant port city of Tangier. But it was far from a bed of roses: the relatively slower pace of life in Tangier also meant that it was challenging to find full-time staff in their restaurant. “We had to do almost everything ourselves. Going to the market to buy ingredients, opening the restaurant, cooking. It was fun, but also very tiring,” Trang recalled. 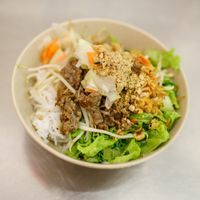 Earlier this year, the couple decided to move to Saigon to sell a Hanoian gourmet specialty that remains relatively unknown to Saigoneers: bún bò Nam Bộ. “We take beef and fry it with lemongrass and garlic. Serve with rice noodles, a little nước mắm sauce, raw papaya… it's very good! Tasty. Just like Vietnamese food, always,” Fabien exclaimed. “But when you talk to them [about the dish], local people here, they don’t know it,” he lamented. Over the years, bún bò Nam Bộ has become a must-eat in Hanoi’s Old Quarter. The dish translates into English as "southern-style beef rice noodles." Rumor has it that the bún thịt bò xào of the south was exported to Hanoi during the French colonial period. It may seem oddly similar and relatable, but the Hanoian preference for high-heat stir-fries and thinly sliced raw papaya, just like the ones found in bún chả, has transformed a southern classic into a unique northern variant. Bún Bò Nam Bộ Bách Phương, on Hang Dieu Street in Hanoi may not be a Michelin star venue, but it draws hundreds of eager foodies on a daily basis. “As a child, I would often ‘torture’ my mother to recreate the specialty at home. While studying in France, I was pleasantly surprised to discover that the dish was actually popular at many Vietnamese restaurants [here]. They call it ‘bò bún’,” Trang explained. The restaurant’s name is an ode to home-cooked family traditions, bà bà (grandmother), a gentle reminder of how granny’s recipes transcend multiple generations. Fabien and Trang’s bún bò nam bộ is authentic, addictive and wholesome; the permeating smell begs you to dig in immediately. Generous servings of freshly fried shallots and toasted peanuts elevate the experience. The right amount of sauce is also vital; the beef and rice noodles are mixed in to achieve a consistency which is neither dry nor too wet. “After months of searching, we finally found the right type of peanuts. Just like the ones we use in Hanoi,” Trang said. One of the nation’s biggest culinary mysteries is how many northern Vietnamese insist on using northern varieties of peanuts; the taste is said to be distinct. The Vietnamese language also retains at least two distinct regional words for peanuts; lạc in the north and đậu phộng in the south. Beyond beef noodles, Bun Bo Ba Ba also offers northern-style deep fried spring rolls, or nem rán, made with special Hanoian rice paper, which is rare in Saigon. A tofu rice noodle alternative is also available for vegetarian diners. Bia hoi-style glasses and adorable blue-and-red plastic stools coupled with Fabien and Trang’s devotion to cleanliness helped me swiftly fall in love with both their place and passion.